The ability of health-care professionals to understand the lived experiences of their patients has become increasingly important but has been a difficult topic to investigate empirically because it involves two distinctive research strands: interpretative phenomenological analysis and patient–provider communication. While interpretative phenomenological analysis focuses on experiences and illness narratives of patients, but not on therapist’s understanding of those, patient–provider communication surveys focus primarily on effective forms of communication without addressing the actual illness experiences of patients. There is a need for empirical research that combines both strands to investigate not only the experiences of patients but also whether professionals are able to understand these. This study combined both strands by means of a novel research method called the Imitation Game (combined with other qualitative methods). This sociological method was developed to investigate what different social groups know of each other’s lifeworld. It focused on the important domain of eating disorder treatment to investigate whether therapists were able to understand the experiences of their patients and vice versa. This study provides insights into the domains in which therapists and patients were able to develop insights into each other’s experiential knowledge (and where they had difficulties in doing so). The findings also implicate the high potential of the Imitation Game as an interdisciplinary research method. 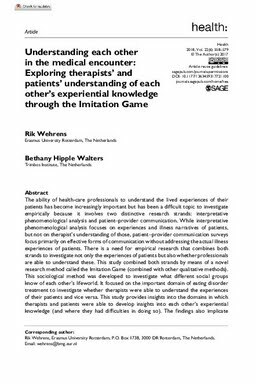 We propose that the Imitation Game may be particularly valuable as a ‘can opener’ that enables the development of in-depth, qualitative insights into the substantive themes that matter in the lifeworlds of patients and therapists.